Wow, what a day for early March in Maine! Sunny and the temperature reached the 50s. We hadn't planned on flying a kite but it was too nice a day to ignore. We grabbed the mini sled we made for Hank and took it out for a test fly. Hank has some giant flow form kites, 125, 252, and 450 square feet, all in the same color pattern, yellow, orange, red and black and I made a mini sled that matched his color pattern, complete with the banner tail. It is about 2 square feet instead of 450. We hadn't flown it yet so we thought we could fly it and get some pictures before handing it over to Hank. When we got to Bug Light Park, we were surprised to see that most of the field was clear of snow. A mile away at our house, there is 2 feet of snow in the yard. We got the kite in the air and took some pictures, relaxing in the warm spring day and all of a sudden I noticed someone with a kite just over the hill. Easy to recognize, even from 100 yards was the pretty light blue of Hank's KONE rokkaku. Yep, he had the same idea we had, too nice a day not to fly a kite. 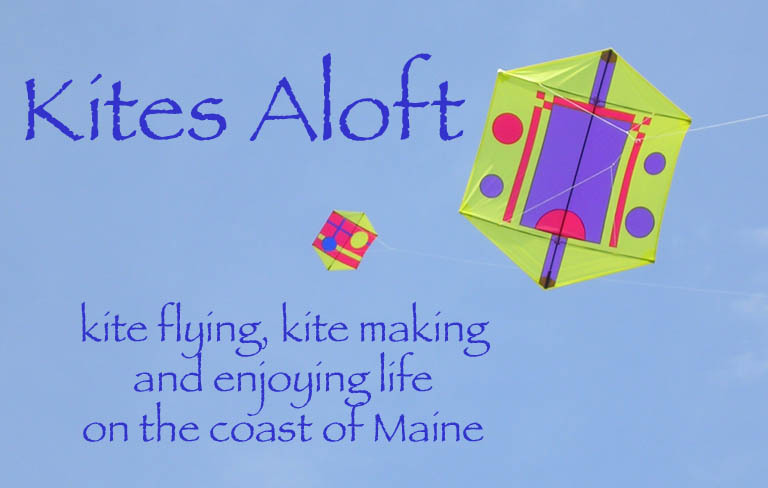 Hank was out with his granddaughter Meagan and they hoped to fly his newest kite, Rolf Zimmerman's Owl. The wind was a bit too light for it but it did look good. By the way, Hank was quite surprised by the mini sled. Fina bilder, ser trevligt ut. Great pics..it looks nice and windy there!